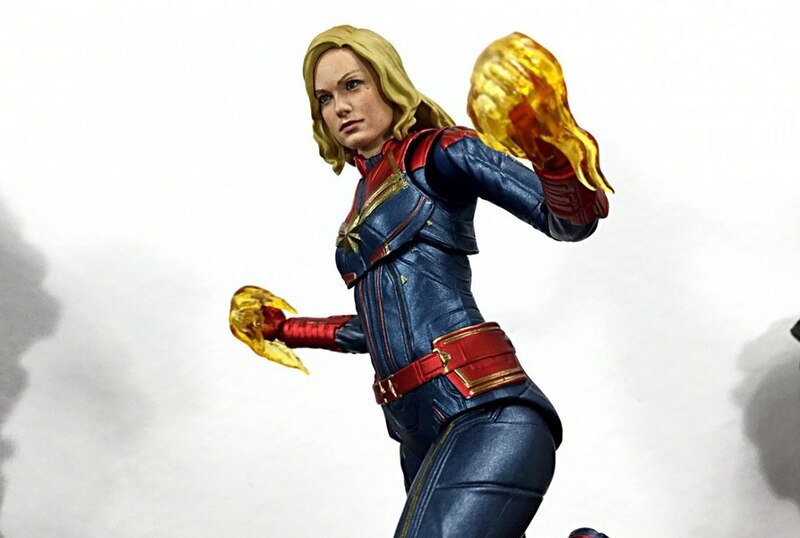 The alternate head for Hasbro's upcoming Marvel Legends 6" Captain Marvel movie figure has been revealed via this new packaged image. 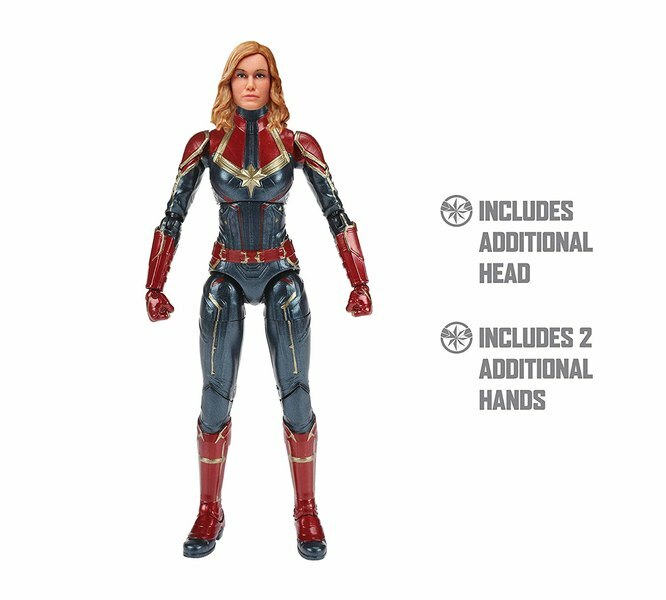 We had already seen the unmasked headsculpt and after seeing yesterday's second movie trailer it should come as no surprise that the alternate head is the helmeted one that matches the rest of her outfit. 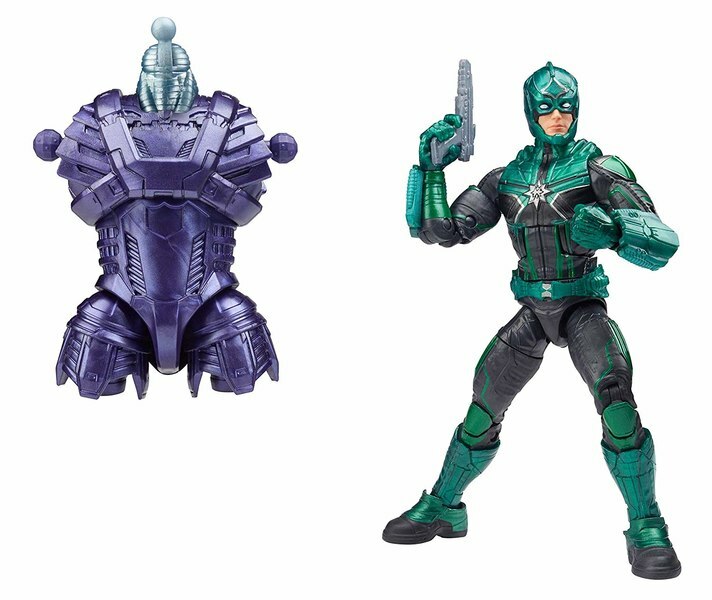 Captain Marvel (Movie), Starforce Commander (Movie), Talos (Movie), Nick Fury (Movie), Grey Gargoyle and Genis-vel. 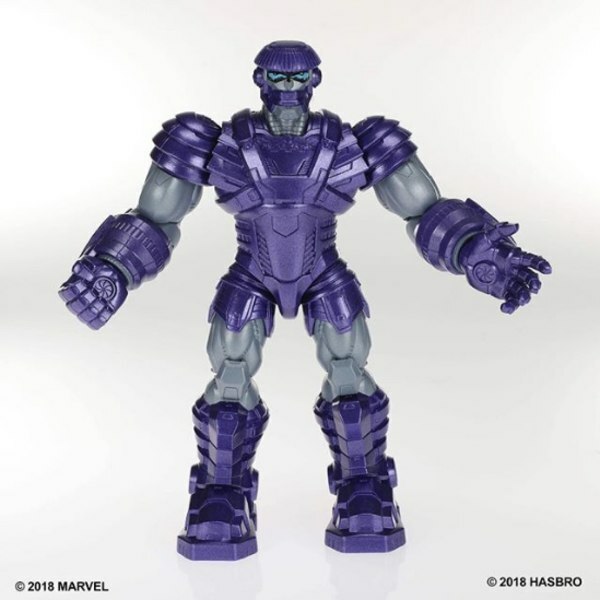 Build-A-Figure is Kree Sentry. Great wave and I'm looking forward to picking these up except for the Captain Marvel with bomber jacket. I mean that just feels like a lazy way for Hasbro to cut costs. 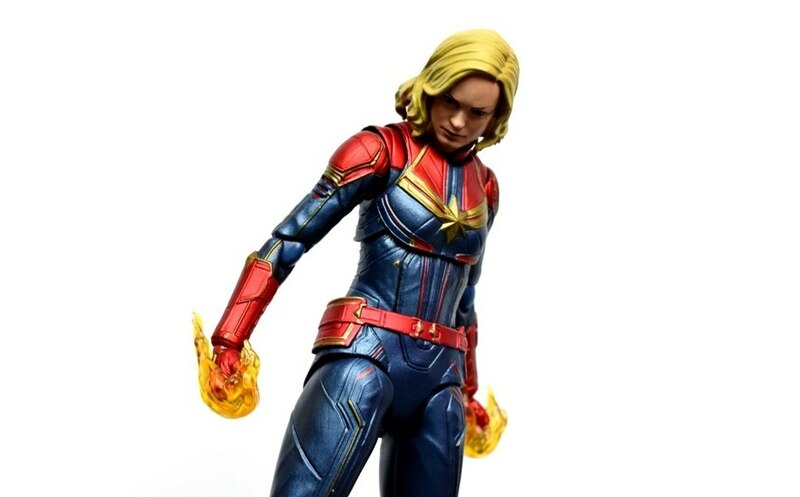 All the other figures are must haves in my opinionbut that Captain Marvel really kind of bums me out . What bothers me about this wave is not the fact that we have 2 Capt Marv. (she is the starof the wave) but the fact that there is only 2 female character in a wave based on a Female led film. I know a certain some one will call me a SJW but they could have at least given us 2 more female characters. it was the same with the BP and the fact that it was full of white characters. Hasbro, if you want to make the mouse happy, follow what the movie is promoting. Part of the problem is that so far Carol is the only female really promoted for her movie and the rest is Nick Fury. I'm definitely digging the Bomber Jacket, though I like the unmasked head for the regular figure a little better, I think. And I like the Starforce doll, too. 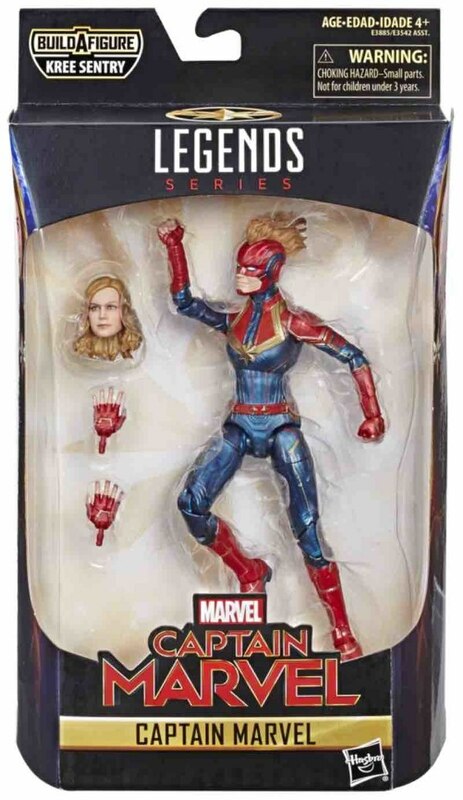 Would make a nice addition to my "action figures with hair"collection (aka Marvel Rising and DC Superhero Girls, lol). The most surprising thing is that Rektangular reported there would be a classic Ms. Marvel with a Dark Ms. Marvel/Moonstone alternate head. He's been spot on with almost all of his other leaks this year, so it's weird if that doesn't end up being the case here. 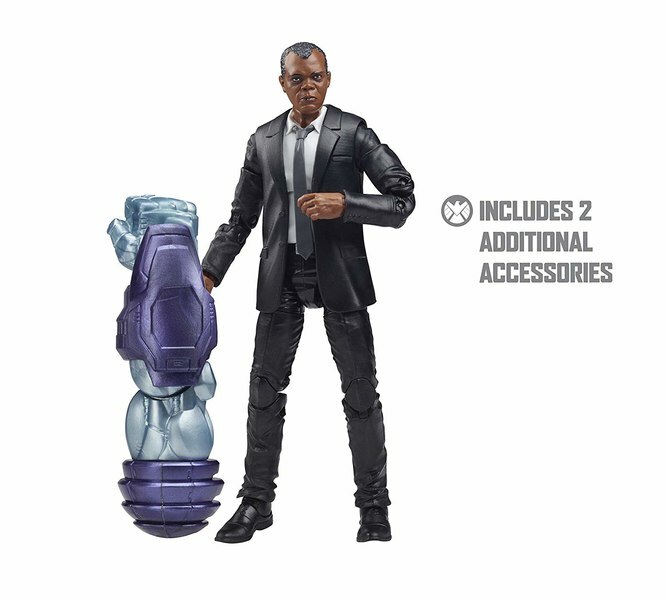 I think he reported similar news with the Klaw and Shuri figures in the first BP wave. Then they ended up being a TRU exclusive. 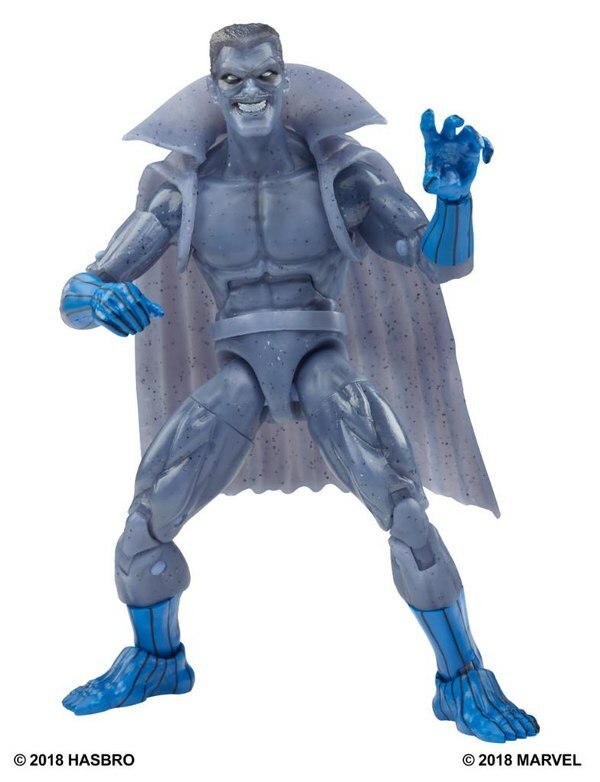 Maybe since the the Cap Marvel wave is also MCU heavy both the expected comic based figures of classic Ms. Marvel and Mar-Vell figures will be released similarly as a 2 pack. So your defenition of a conspiracy theorist is anyone who questions the official narrative? No. But given what I've witnessed of your posts and your endless, hyper focused babblingon that particular topic, yes, I'm going to call it a conspiracy theory. That's perfect because I ain't reading your manifesto, LMAO. Save it for Alex Jones' site. Already addressed. Try reading before you write your next novel. Keep in mind that I have worked in a similar industry (young girls toys, dolls to be exact) in the art department, meaning digital and hard sculpting and everything you just said about character likenesses and production and storage of such is just inaccurate. DuringThe Force AwakensandRogue One, the Propshop crew were tasked with making 3D scans of props and actors. You may recognize their photo rig from pictures of motion-capture performers likeLupita Nyongo, but they scanned regular live-action actors as well. InRogue Onethey even scanned the extras, tying intoGareth Edwardsimmersive filming techniqueon a 360-degree set, where crew members had to dress as background characters in case they were caught in shot. The resulting 3D models are useful for continuity purposes, but theyre also used for CGI sequences, video game references, and detailed action figures. Once an actor has been scanned, Pinewood Studios has their face, body, and costume on filewhich is a little creepy, but also kind of fascinating. That actually sounds entirely reasonable. These sorts of projects have master design documents containing images of all the actors in costume that go out for merchandising well in advance. That's why you'll often find examples of figures that have costume inaccuracies vs. the finished product; they're working off material given over to the merchandisers at a relatively early stage in filming, and thus can't account for changes made as the production progresses.They'd have plenty of images and publicity photos to work off of when creating likenesses. Look at it like this: Hasbro is using the real face printing tech on the Clone Trooper figures in The Black Series. 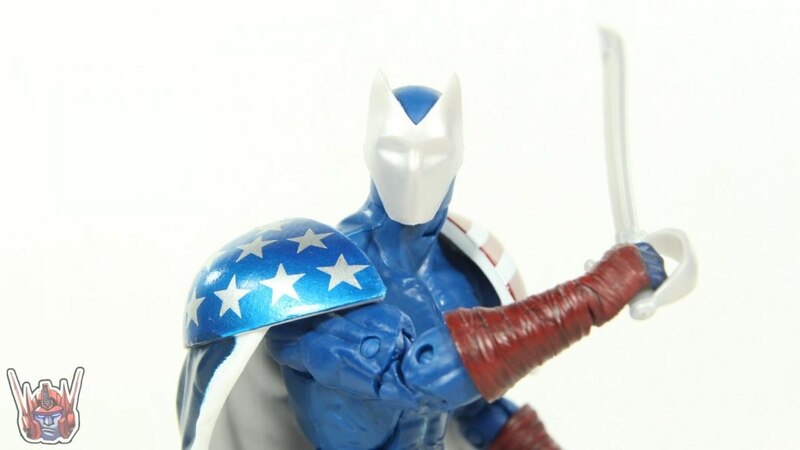 Do you think they're calling in Temura Morrison to fly into Hasbro HQ and do a new round of photos every time they want to make a new action figure based on one of his characters? It's actually infinitely easier in this case; the entire wave contains about two new figures; the rest were all repaints or head swaps of bodies that had already been sculpted and tooled from previous waves. 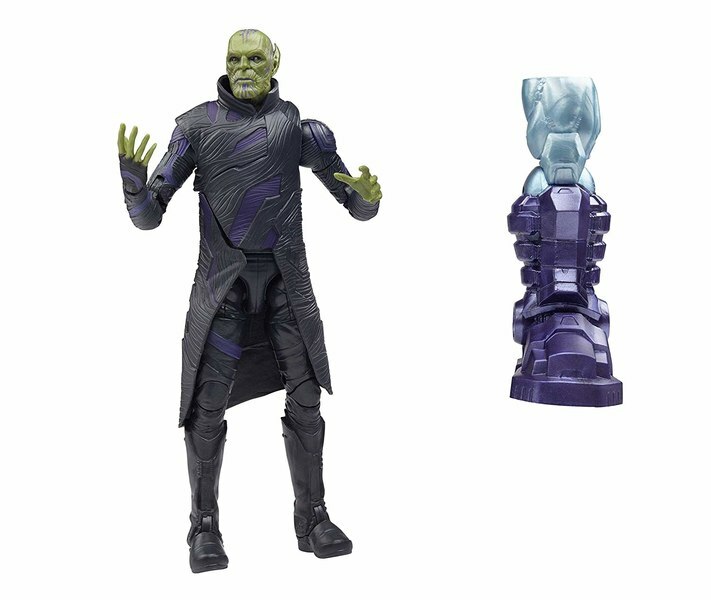 The only 100 percent brand new character near as I can tell is the BAF, possibly Klaue. Even Killmonger reuses parts from Netflix Punisher and the previous two-pack Killmonger, in addition to a unique torso. I'm certainly more apt to believe people who actually worked on it vs. conspiracy theorists complaining about agendas. So your defenition of a conspiracy theorist is anyone who questions the official narrative?Didn't mean to offend you by not blindly believing like the rest of the flock, but I'm sure you're familiar with all nearby safe spaces.It's better to actually have independent thought and question agendas and risk triggering the lemings than to pretend they don't exist just because you happen to agree with them. I'm not sure how long you've been a collector, but I've been at it for quite a while. It's not like Hasbro has never lied to us, whether intentionally or by honest mistake. And don't act like Disney has never had an agenda to push. They were 100 percent behind the entire Marvel gender/race/sexuality/religious idiology fiasco that blew up in their face. Yes, projects like Ms. Marvel and Champions were good and successful but those are the exception, not the rule.And for the record I do agree with many of these issues but don't outright agree with everything they stand for. Just like every other aspect in life there are both good and bad sides to everything. To flatly agree with something's base fundamentalism is not only ignorant, but its dangerous, cuz most people love to listen when it's things they like but tend to turn a deaf ear when the stark realism of the things they don't like start to come out. You go ahead and follow the world wide cult. I'll think for myself and form my own oponions,thank you. If it makes you feel better to call any thoughts outside of you or your group's own thoughts and opinions conspiracy,then by all means, feel free. Sheep are a dime a dozen, my friend. As far as your vast knowledge about the industry and the people who work in it, just try and imagine my surprise at a certain amount of misinformation you managed to mix in with some of your admittedly factual information. Keep in mind that I have worked in a similar industry (young girls toys, dolls to be exact) in the art department, meaning digital and hard sculpting and everything you just said about character likenesses and production and storage of such is just inaccurate. And moreover, any and all production of new or amended design takes TIME. Even in a field where I worked where we used as many reusable parts as possible, up to 90% in most cases,a year is entirely feasable, but anywhere between 4 - 6 months is not, no matter how compressed the schedule is. Do you know why? Because of factory schedules. In order for a factory to be successful it has to constantly run products for several franchises and properties, all waiting in lineto have those products finished ASAP. No one is stopping production and waiting on ML to decide what they are doing next.All product lines have their own independent management and their own deadlines and no one gets to cut in line. The people from My Little Pony division couldn't care less about ML's woes, deadlines or commitments. They have their own issues to deal with.This is just the way manufacturing works, from glass production to airplane parts (2 other fields I have experience in), that's just the way it goes. Anyone who has worked in an industry that regularly use the dreaded terms "lead time" or "set up time" can attest to this. Every productiontime gets reserved and is subject to pre-approval, meaning you would have to show that you would have final product design ready to go into final production in time for your reserve. Something that most "emergencies" cannot guarantee. There is no such thing as an EMERGENCY WAVE.Consequently this also sheds some light on the constantly asked question of why many ML waves seem to hit at exactly the same time. The simple fact is that orders are put in just as fast as humanly possible to whichever facility can get them into schedule the quickest and as a result some waves get produced consecutively one after another or perhaps even simultaneously if done in different facilities. After that the the priority is to fill the retailer's order as quickly as possible in order to secure payment. Many times the retailer will take the product and store it in their own warehousing facilities to be shipped out at the time of their chosing. That's why sometimes products get released by some store chains earlier than others. Most of the time the reasons Target sees products hit the shelves before Walmart, or vice versa, has nothing to do with Hasbro. Now, I know you're super smart, cuz you've let us all know repeatedly on several occasionsbut maybe just try and stay in your own lane on this one, just this once and allow me to re-educate. Free of charge. 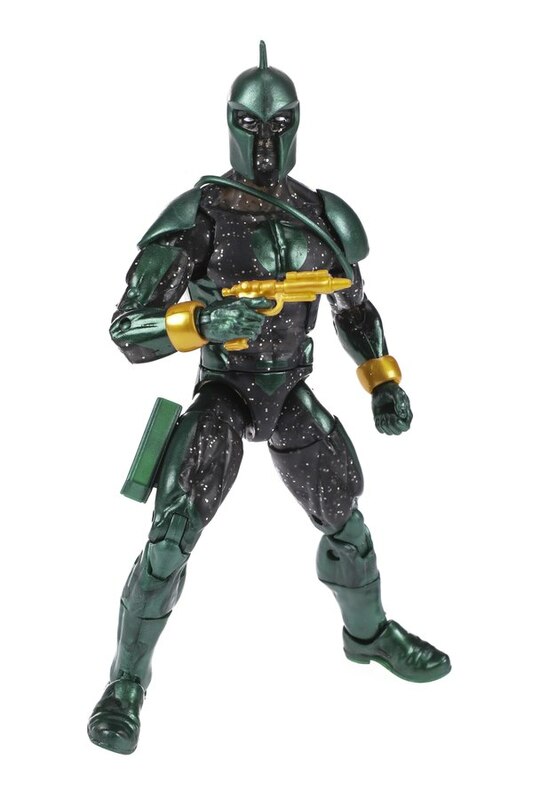 There are contractual obligations involved in using the likenesses of specific actors on both sides, but no matter what those negotiations on the movie side are, they are a different set of negotiations altogetheron the toys and product side, meaning, there is some sort of negotiated compensation for both. Actors don't sit for free for the product manufacturers,regardless of how big their overall involvement was in the movie. Why do you think the 10 years products were more expensive than standard ML?The little bit of extra plastic and paint did not account for an added 25%.And yes, if they planned on using Temura Morrison's digitally mapped likeness in the SW Black line now or in the future they had to bring him in at least once (and probably even arrangedfor several different scans to avoid future travel facilitations), as I believe all previous versions of figures based on his likeness did not employ the current technology. Those images would then be stored for future use. The implication of the suggestion that he be brought in any time they wanted to do a newfigure or product based on his likeness is both exaggerated and misleading in your attempts to back your point. Again, imagine my surprise. 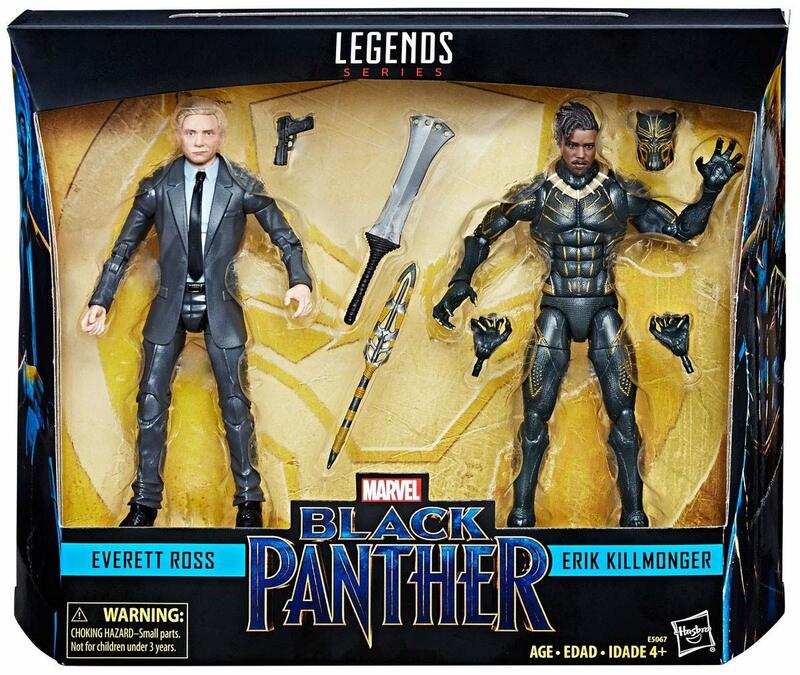 Now the compensation and further royalties to use and store the likeness of a relative unknown such as Morrison versus the one of an up and coming hot commodity such as Jordan are vastly different, meaning if it was not intended to do a figure of Jordan as Killmonger, then why would they have paid to have scans of him to be stored? Your arguments essentially cancel themselves out. Either they had his likeness in store with the intent of using it or they truly created a new wave which required at least some form of prototype, approval, tooling and mold fabrication, even with the amount of existing parts used. Like I said, no shortcuts. The only way to avert the long path was maybe if a wave, possibly the Kingpin wave, had a scheduled commencement date and they switched it out to do the BP 2nd wave in the end. It still lends to the question, why did they have Jordan's scan if not to be used. I've been on this forum for a long time and I've gone into extended diatribes on what I know about the industry before and maybe a few of the mainstays here even remember and I'll probably get repremanded by Tarot for getting a little political and calling you out for your misinformation, and for that I will apologize to the community in advance, but you are by far the most.....let's just say..."self assured" person I've seen on this forum in a long time and for the most part I've defended your opinions to some other members, but when I see someone pushing straight garbage as factwithout providing any verifiable facts to substantiate it, while also labeling other people's thoughts as conspiracy I'm gonna call you, or anyone, out every time. So you go ahead and keep on keeping on with that overinflated sense of superiority and self worth and I'll go ahead and keep bringing you back down to solid ground when necessary. I just provided you with more real world knowledge than what you probably got out of that Liberal Arts degree you put yourself into $100k worth of debt into for and all from the comfort of your smart phone screen.Consider it a gift. But don't you worry, I'm sure you are well on your way to Junior Senior Co-Shift Leader at the Starbucks Customer Support department stillKeep at it, buddy. Also, judging by your interactions in the past I know you love to argue a point to death more than my OCD lawyer cousin, but I'm letting you know in advance that I refuse to be dragged any further into this discussion that you clearly have no idea what you're attempting to speak to. Any further enlightenment will not be provided free of cost.